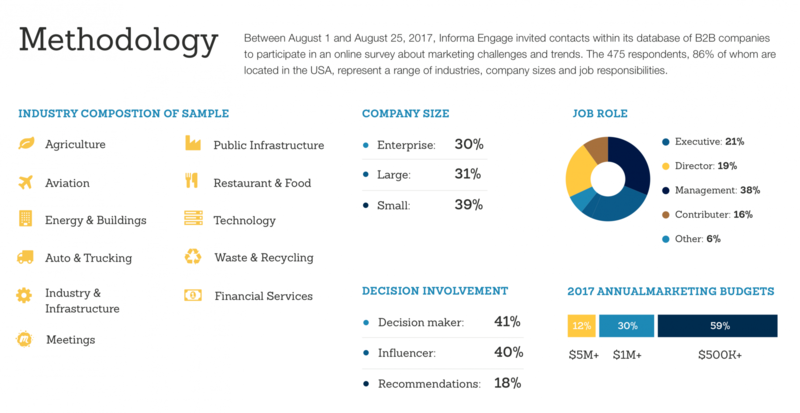 The Informa Engage SmartReach database reaches more than 30 million business professionals across high growth markets. We deliver business insights and relevant content through hundreds of industry leading websites, publications, eNewsletters, trade events, eLearning platforms and online directories. Our brands, rich data and powerful marketing programs connect you with business decision makers in the U.S. and abroad. Informa’s industry brands are trusted by 30 million professionals - spanning top growth markets. Self-reported data from 30 million business decision makers who engage with Informa’s award-winning editorial content, events, whitepapers, webinars, and workflow tools. With over 1,000 data points and behavioral characteristics, Informa Engage SmartReach provides rich customer insights and the ability to reach deep within a vertical market or horizontally across markets. Reach across our top growth markets to connect with decision makers, influencers, business professionals and prosumers. Informa Engage SmartReach enables marketers, agencies and brokers to target, engage and activate audiences from Informa’s proprietary database of 30 million global B2B decision makers. For more information on Informa Engage SmartReach fill out this form and one of our strategic consultants will connect with you. Complete form below to receive New Equipment Digest data card. Complete form below to receive American Machinist data card. Complete form below to receive IndustryWeek data card. Complete form below to receive Defense Electronics data card. Complete form below to receive Engineering and Design Masterfile. Complete form below to receive Architects data card. Complete form below to receive Farm Progress data card. Complete form below to receive Beef data card. Complete form below to receive US Agriculture Masterfile. Complete form below to receive Aviation Masterfile.